We had already talked about how great the Synfig animation suite of programs is elsewhere on this site, but what we were missing is actually talking with the person who makes it possible. 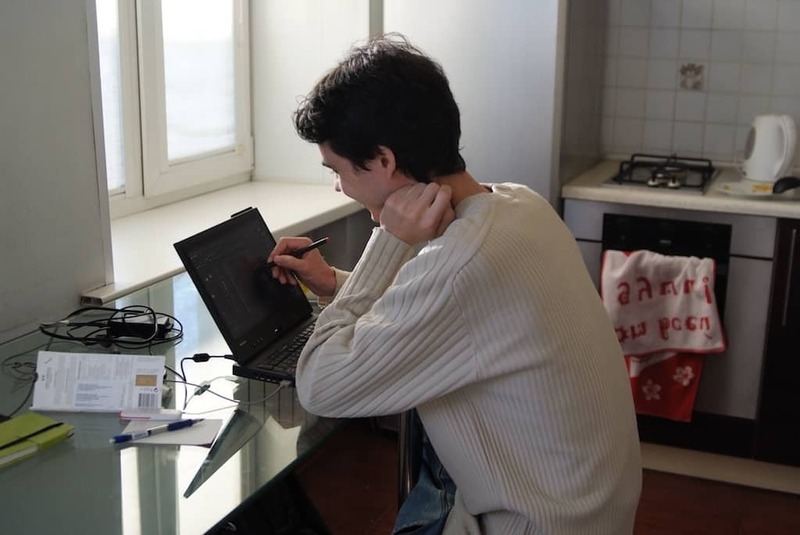 We got together with Konstantin Dmitriev, Synfig’s de facto project leader, main developer, head fundraiser, and all-around evangelist, to find out how he got involved, what’s brewing in the world of Free Software animation, and where the project is headed. Paul Brown: Hey! How are you? KD: I’m fine. How about you? PB: Fine. So it’s late evening over there, right? Out there, in the middle of Russia? PB: I guess which begs the first question: How does a quite isolated town in Siberia become the center of the Linux animation universe? PB: “Center of the 2D animation universe”, then. Amsterdam is more 3D/Blender and so on. KD: Yeah. To start from the beginning, since my childhood I had a passion for animation. When I was a kid, I was always trying to make animations along with my two other brothers. PB: And how did you do that? Pencil and paper? Or did you already have access to computer programs? KD: We didn’t have computers back then, so we drew on paper and shot it using a camcorder. PB: You seem very inspired by anime. When you sat down in front of the TV as a child, what was it going to be? Dragon Ball and Doraemon? KD: Oh, my anime thing didn’t begin until 2001. I live in a remote town, Gorno-Altaisk, so it was hard to find anything on this topic. Anime was a totally rare thing. There were two TV series translated and shown on the local TV channels: Sailor Moon and Pokemon, but I missed them both, so, the only way to get anime was to contact anime fans in other towns and try to make an exchange by post. That was cool. 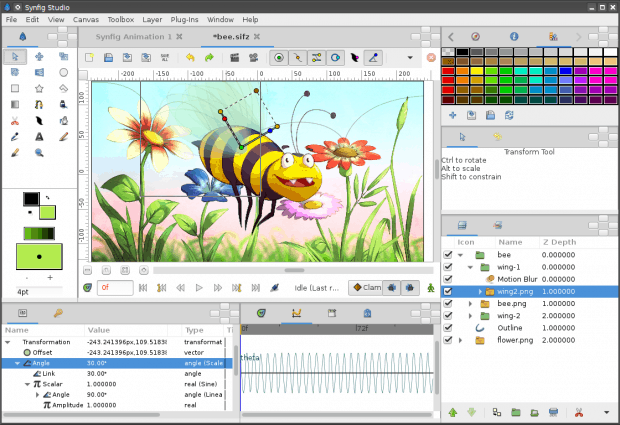 Gorno-Altaisk, the unlikely capital of Linux-based 2D animation. Photo by Vitecek for Wikipedia. PB: “Post” as in “using a letter”? With an envelope and a stamp? KD: Right, like EMS. I mean an EMS package. We were using CDs to transfer the copies. Of course it was not legal. But there were no “legal” copies sold in Russia back then, anyway. PB: Ah! Now I understand! You were swapping videos with each other over courier. The bit transfer rate must have been horrendous. I also travelled to other cities to buy anime when the first CDs appeared on the market. 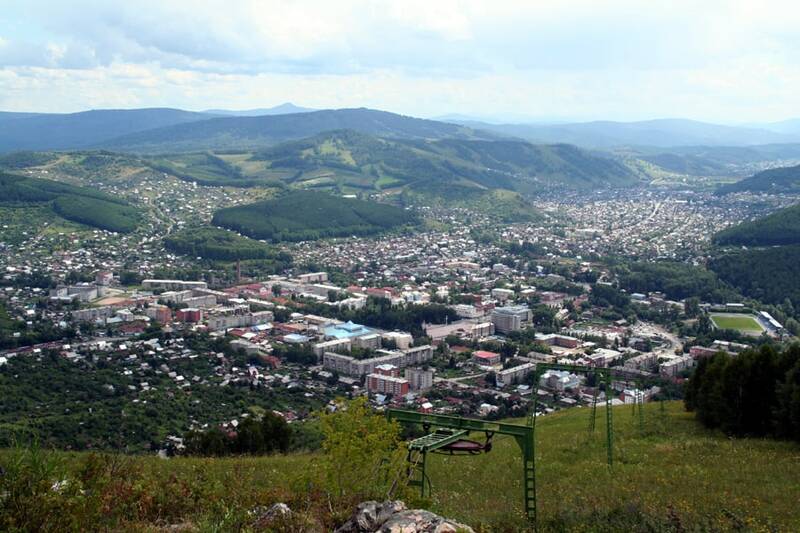 I had to travel 500 kilometers to Novosibirsk to get my first TV series on CD (Novosibirsk is the nearest big city). PB: That’s crazy! What series was it? KD: The first TV series I brought to our town was Evangelion. As far as I can tell, it was the first ever anime TV series that became available in our town. There wasn’t much demand just because people wasn’t aware what anime was. They thought it was just cartoons. PB: And you shared it with your friends? KD: Yes, I shared it with a few friends of mine. The fact is, this first anime made a significant impact on me. It’s a classic. PB: Tell me how you found out about Synfig. KD: Aha, Synfig. Well, I started teaching animation in the local computer club when I was 17. I was teaching Flash. KD: Besides my passion for animation, I was very geeky. I loved everything about computers. So, approximately at the same time, I heard about Linux. It’s a funny thing – Linux was as much a rare thing as anime and even harder to get! PB: Where did you hear about it? PB: Is the Internet still bad where you live? Did you get CDs from the magazines? KD: Well, Internet is better, but still not enough. I have 200 Kb/s download and 50 Kb/s upload at home (I am living in the remote part of town). In the middle of the town people can get Internet 3 times faster. PB: Ouch. So where did you get your first Linux distro from and what was it? KD: It was hard to find. But I finally found a person, who had a complete distro. It was Debian 2.2 (Potato) on 6 (!) CDs. That was amazing – CD copiers weren’t popular yet at the time. So I installed Linux and started digging into it. The first time I installed, I couldn’t do anything with it for several months. But I loved its philosophy and concept so much, that I stubbornly started it every time I switched on my computer and dug into it again and again. KD: Yes, it was 2001 or 2002 I guess. PB: Something like that. Wasn’t it great to get things working, though? KD: That was an awesome feeling. But my animation tools were still Windows only. PB: I can’t remember anything on Linux from around that time. KD: Even GIMP was a challenge! PB: They did develop a kind of basic animation plugin for GIMP. Remember that? GAP it was called. KD: Yes, I remember GAP, but I wasn’t ready for frame-by-frame animation. And then, in 2006, the same friend of mine who gave me my first Linux, he told me about Synfig. He said – “Have you heard about that animation program that has recently been opensourced?”. I wanted a quick vector tool, with cutout-like approach. PB: When did you start being a contributor to the project? KD: That begun in 2007. Slowly I learned Synfig, carried out my first tests. At that moment, two things became obvious to me: (1) I wanted to make my own anime and (2) I wanted to make the animation using Linux. Right at the same time, the Elephants Dream project appeared. That was an OpenMovie project from the Blender Foundation. It was so attractive and inspiring. It was amazing for the time. 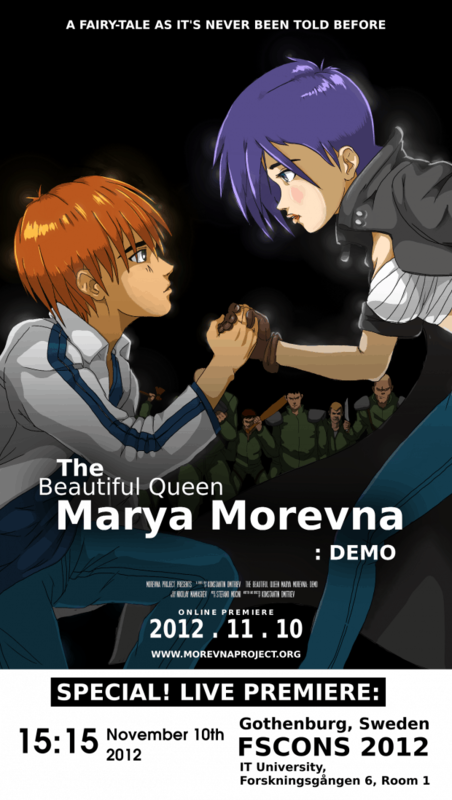 It made me want to make “my own big anime”: Morevna. I didn’t have screenplay at first. I was looking around for ideas. I was also looking around for tools. By that time, I had already got some experience for creating animation from commercial work and teaching with Flash, Moho (Anime Studio), and some 3D tools (3DS Max, TrueSpace and some others), and I was thinking about this big project. But one thing was clear: I was sure none of those tools would be a good fit for me to make a BIG project. They all had disadvantages that were distracting me. Synfig allows animating using vector graphics. But when I discovered Synfig, then it became obvious for me that it would be a good fit for what I needed. It was buggy, yes, very unstable, very unpolished, but I saw that it had a strong concept inside. PB: Do you have a screenplay now? And is Synfig a good enough tool now? KD: Yes, I do have a script now. It’s a draft in English. Currently we have reworked it a lot conceptually. 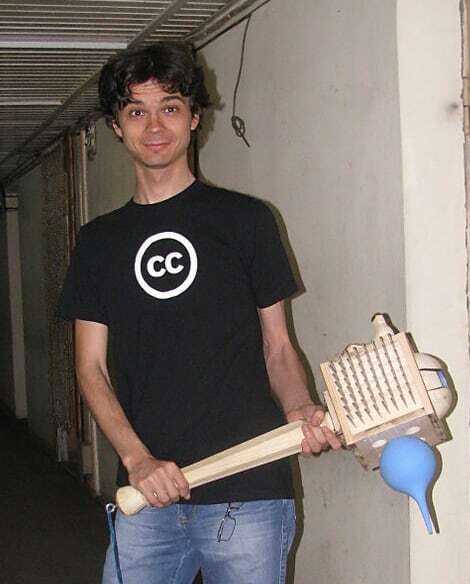 The idea of Morevna came from the computer club. I was teaching kids there. And every year we made animated shorts. In 2005, with a group of my students, we made a modifications to the Morevna fairy tale. Evil robots are the villains in the reworking of the classic “Morevna” fairy tale. KD: And, when later I was looking around for ideas for my own anime, then I remembered our Morevna. 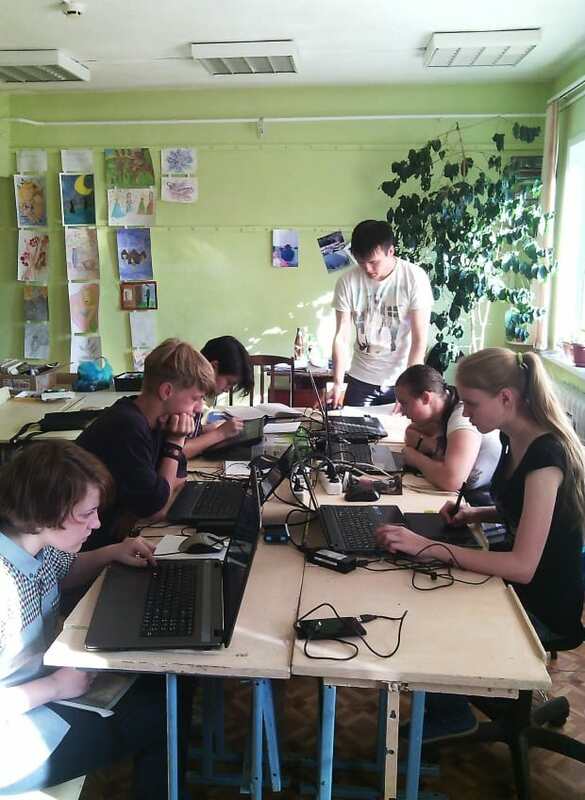 I remembered that we had a lot of ideas that we hadn’t managed to fit into the short animations made by the kids. So I started to work on the screenplay in 2007. And in December 2007 I finished the first version. Now it’s on a wiki. PB: Does that mean anyone on the team can contribute to it? KD: Well, I put it on the wiki a long time ago, but we haven’t actively used the wiki for several years. I am ultimately responsible for the screenplay. But sometimes we have some discussions with the team to establish some concepts or work out ideas. PB: When do you plan to finish the film? KD: Since we have no stable funding it’s hard to make any predictions. But we have split the screenplay into episodes. If everything goes according to plan, we can finish the current episode by November 2015. That’s if Anastasia [Majzhegisheva] will be able to keep working at the same rate. 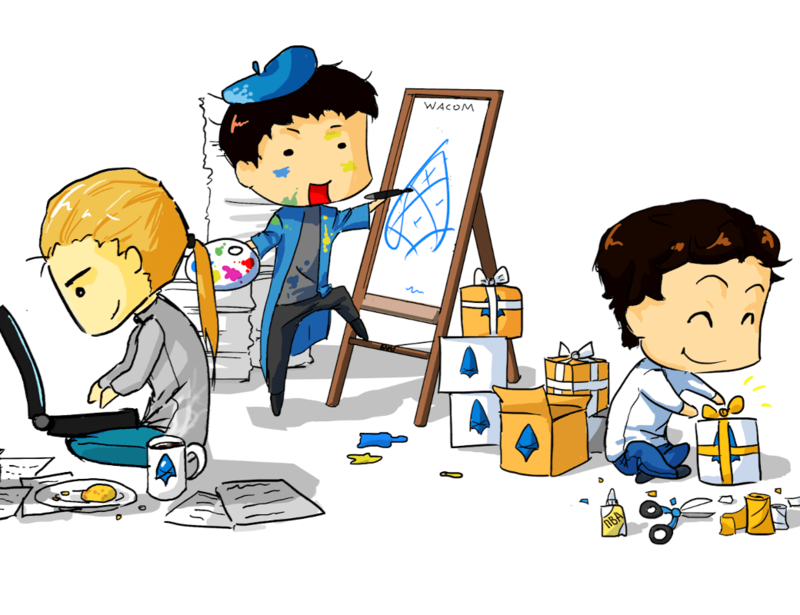 PB: Anastasia is the artist, right? KD: Yes, she is drawing most of the artwork for Morevna. She is still at school though. That means she has some time limitations. PB: What is the current episode? Please don’t tell me its the intro. KD: The current episode contains Morevna’s departure plus The Return of Koshchei The Deathless. PB: Do you have a budget for this? What would it take to speed things up? KD: Well, we need at least $1000 per month to have one artist working full time. KD: If we got the funding, we would be able to finish the first episode before November 2015 for sure, five months. PB: $5000 doesn’t sound unreasonable. KD: In fact it is very cheap! Actually, If we could have Ivan Mahonin (our developer hired to work on Synfig last year) working with us for full time, then we can solve problems as they crop up quickly. But that’s additional cost. PB: That is a good question: What is your current day job? PB: And you get paid for that? For teaching maybe? KD: Yes, I have income from training videos, from the Synfig Training Package plus donations. But most of that money goes to Ivan [Mahonin, another Synfig developer], though. Before January 2015 I was working on a big animation project. It was stereo-3D animated cartoon, made with Blender and Synfig. It was intended to be viewed using 3D glasses. That’s a sample. That was my job for 9 months. It is a stereoscopic educational animated movie. So, I have some money savings, which allows me to keep working on Synfig/Morevna for some months. PB: But currently your main job is Synfig. KD: Yes Synfig. And Morevna. But I have no income from Morevna yet. But current Patreon pledges allow me to pay a small gratification to Anastasia. PB: How could you solve that? KD: I think Morevna won’t get any popularity until we release the current episode. PB: Well, there’s a thought: Instead of a feature, make it into episodes. At least people can get to know it as a series, and may be more willing to donate. KD: Exactly. As for on how to solve the funding thing now, after I update the Synfig Training Package for Synfig 1.0, I expect the sales to increase. I hope they can partially cover our Morevna production. I also haven’t given up on the thing either. It’s just a slow process with current resources. But we are moving. I understand that we need a better website, with a clear explanation of the project’s ideas, what we do and what we need. This is also what I am working on right now. The “Morevna” club at work. PB: Getting back to Anastasia and your other students. It seems from the reports coming out of your town that you have created a kind of talent school for free software animators. KD: Yes, spreading the word about our work helps a lot! It’s still more like a small club at the moment, but we’ve got some really talented students there. PB: How many people are in it? Are they all teenagers? KD: Not counting Nikolai Mamashev or me, there are 7 or 8 people who attend regularly. There are also a few random people who come and go. And, yes, most are teenagers. There is one girl who is 11, though. And Nikolai and I: we aren’t teenagers. PB: Do the students ever complain about your weird choice of tools? KD: In fact a year or two ago we had a few complaints from some newcomers, but this stopped happening for some reason. PB: Really? What did they want to use? KD: For drawing keyframes. 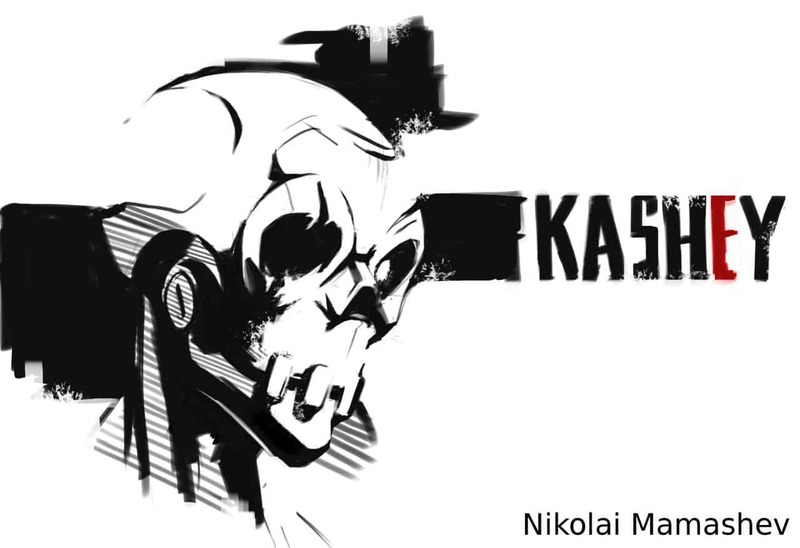 But, for example, when a person comes to the studio and sees Anastasia or Nikolai doing awesome things in Krita or MyPaint, then it becomes quite natural for them to get bitten by the Free Software bug. PB: Let’s get back to Synfig itself for a sec: What are some features you would like to see implemented into the program? KD: First of all I would like to have a new real-time rendering engine. The speed is critical right now. The second thing is lip-sync. We will surely need that for Morevna. The plan for the lip-sync feature is to have a tight integration with Papagayo. Finally I would mostly like to have frame-by-frame animation tools. 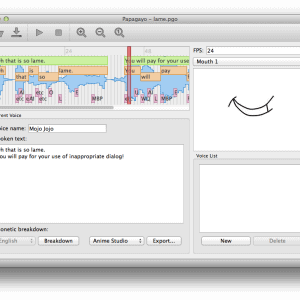 Papagayo allows you to synchronize speech with your characters’ mouths. PB: Hasn’t Papagayo been abandoned for a long time now? KD: It was. But when I needed a lip-sync tool, that was the only solution that fitted my needs. I made several modifications to it (adding a new breakdown, languages, some other tweaks). I also put together various modifications scattered around the LosMarble’s forum, the original developer of Papagayo. And several months ago Papagayo was revived by its original developers. They have re-written it completely! Unfortunately, they haven’t had any activity since then. PB: When you say “frame-by-frame animation”, do you mean as in the traditional type of animation, where you have the background and animate the foreground… well… one frame at a time? PB: Okay, that was a dumb question with an obvious answer, but why would you want that? Isn’t using vectors much more efficient? KD: Frame-by-frame animation is time-consuming, but very powerful. It makes your animation look alive and, if we integrate it into Synfig, then we can combine the frame-by-frame animation parts with sprite motion, with all of the effects and bones. This would be fantastic. 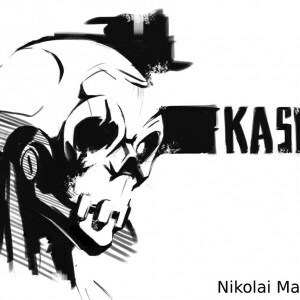 Imagine a character split into parts attached to skeleton, cutout animation style. You can animate it by using a skeleton. But imagine if you can, at the same time, draw his hand. You can have all the character animated using a skeleton (tweened), except his hand, which can be animated frame-by-frame to make a complex gestures. That would be a crazy powerful mix! She draws frames in MyPaint and then mixes them in Synfig. Of course it would be much more convenient and faster to draw directly in Synfig. PB: Apart from yourself, who would you like to see using Synfig in their work? KD: I really would like some big animation studio to use Synfig. Of course it’s a bit early for that, but we’re getting closer. PB: Are you familiar with Nina Paley’s work? 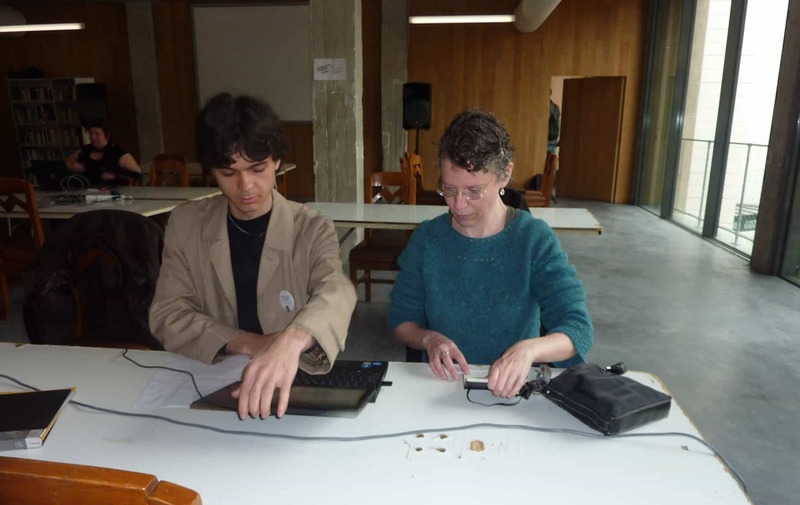 Konstantin demonstrates Synfig to Nina Paley. Photo by Carlos López González. KD: Yes, I met Nina in 2013 in Madrid during LGM [Libre Graphics Meeting 2013]. PB: It looks like that Synfig would be a good fit for her style of animation. KD: She won’t be working with Synfig until it gets faster. PB: The rendering you mean? KD: Yes. The real-time playback of the animation in the work area. PB: We know that the most pressing thing for Synfig is money right now, but how else can others help the project? KD: Good question! The first thing would be to use it for making animations. The more good work made with Synfig, the better. Secondly, join the forum and help answer some questions. The community needs to grow. Currently, with all the things I have to do, I have no time to personally read the forum, but there are several regular people who help others there. One more way to help is to translate information on the website. That will help people who don’t understand English to learn about Synfig. Currently we have an established translation mechanism for the main website, so it’s easy to participate for anyone. I plan to apply the same approach for Synfig’s wiki documentation. And, of course, you can also participate in the localization of the Synfig interface! Finally, if you already have some skills with Synfig, then sharing them by creating tutorials would be much appreciated. PB: A lot to think about. It seems to me that the Synfig developers’ efforts definitely deserve to be backed up by a community. Let’s hope that happens. Thanks for your time and I hope to see the first episodes of Morevna soon. PB: Talk to you soon. You’re welcome. I’m sure you’ll find that working with Free Software is very gratifying.